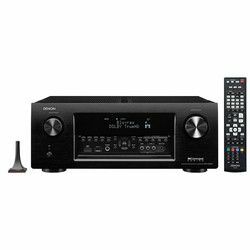 Selecting a high-end, advanced AV receiver to purchase, compare the premium devices produced by the international D M Group Holding, their performance and functionality. Is Denon AVR-X4000 vs Marantz SR-6011 more user-friendly and powerful? Which amp offers more accurate sound reproduction? At first sight, the Marantz receiver is more advanced and feature-rich. This nine-channel device supports multiple audio formats, including DTS:X and Dolby Atmos, offering Bluetooth and Wi-Fi connectivity options. Therefore, the amplifier creates dimensional, 3D sound, as well as its counterpart. What are the Denon benefits? The amp is 7.2-channel, but it still supports 9.2 processing. Its Audyssey calibration system is accurate and fast. It has built-in DTS-HD Master Audio and DolbyTrue HD, supporting WAV and FLAC files. Denon AVR-X4000 home theater is DLNA 1.5-certified, so any music can be streamed from your laptop or PC. It has no Wi-Fi or Bluetooth options, but the connection is enabled by the Ethernet cable. AirPlay feature is still enabled, so control via Apple or Android app, with Pandora or Spotify services is possible. Both home theaters come with the generous, or, I would say, maximum possible HDMI ports number. Marantz SR-6011 comes with 7 rear and one front panel input, including analog ones. Ethernet control is also enabled. The Denon amp has 6 rear and one front HDMI port, but it stands out for the third output availability that is used for the different audio or video equipment connection that is, for multi-room purposes. 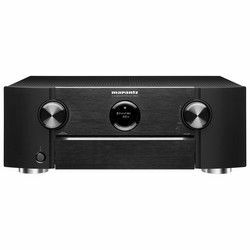 Marantz amp still has no HEOS multi-room support. Additionally, the front panel and the interface of the Denon AVR-X4000 model is much easier-to-use and more intuitive versus its Marantz counterpart. It comes with the handy display and the sockets and buttons that are conveniently located. Marantz SR-6011 amp is easy to set up and use, but its remote is not back-lit, and not as ergonomic as the Denon’s one. Additionally, the menu is functional, but just common, not outstanding. Marantz SR-6011 vs Denon AVR-X4000 is a bit more powerful, but the difference is very slight. Both devices produce articulate, crisp, detailed sound, with great, 3D effects. However, the Denon amp focuses on the midrange. Its performance is fast, agile and sharp. The Marantz receiver stands out by powerful, rich bass, great dialogue reproduction, warm, engaging vocals. Marantz SR-6011 versus its Denon counterpart is more feature-rich. It supports a great number of formats, coming with Bluetooth and Wi-Fi connectivity, producing great, detailed sound, notable for rich bass. On the other hand, Denon AVR-X4000 has perfect Ethernet connectivity, multiple streaming features. It produces accurate sound, focusing on the midrange. The home theater is feature-rich and powerful. It supports a lot of up to date audio formats, comes with Wi-Fi and Bluetooth connectivity and offers a generous number of HDMI ports. The amp produces excellent, detailed sound, notable for rich, deep bass. However, it has no multi-room opportunity. The amp is high-end and advanced. It comes with the latest streaming features, producing excellent sound, notable for accurate, detailed dialogues, perfect midrange. The home theater has multiple HDMI ports, offering multi-room opportunity. It has no Bluetooth or Wi-Fi features, but the connectivity is enabled through Ethernet.